Wayfinder. Bag of holding. Ring of the ram. Staff of power. Holy avenger. The magic items you find during your adventures become a part of your story and let you do things beyond the techniques you've mastered and the spells you know. So how do these essentials of the game work in the Pathfinder Playtest? Magic items are used in three major ways: by investing them, by activating them, or automatically. Invested items are ones you wear that you have to prepare as you don them, after which they work continuously. Activating items follows a system similar to that used for spells. Just as casting a spell requires you to spend actions to supply the somatic, verbal, and material components of the spell, activated items require you to use the Command Activation, Focus Activation, or Operate Activation action, or a combination of multiple actions. A potion requires you to spend an Operate Activation action to drink it. A necklace of fireballs requires you to spend 2 Operate Activation actions to unbind a bead and throw it. Activating a luck blade to reroll an attack just takes a mental nudge with a Focus Activation reaction (though you get to do that only once per day). Automatic activation happens with a small category of items that give their benefit whenever they're used for their normal purpose. A prime example is a sword with the frost property rune, which is always coated with frost and needs only hit a foe to deal extra cold damage. Activating or investing an item costs 1 Resonance Point (RP). You might have heard a bit about this on the Glass Cannon podcast! Resonance is a new resource all characters have that can be used to activate items. Your innate magic item resonance is represented by a number of Resonance Points equal to your level plus your Charisma modifier. This ties back to the Pathfinder First Edition concept of Charisma as the main ability score tied to innate magic, as seen in the Use Magic Device skill and the fact that Charisma is used for spell-like abilities, oracles, sorcerers, and so forth. However, in Pathfinder Second Edition, true scholars of itemcraft *cough*alchemists*cough* might get to use their Intelligence instead. The idea of resonance stems from the Pathfinder First Edition occultist, who was able to tap into the magical potential of items, and even before that to the idea of resonance between creatures and various magic items, as seen with the resonant powers of wayfinders. We've expanded that concept to apply to everyone. In practical terms, you're really unlikely to run out of Resonance Points unless you're using an absurd number of items, and you're at the greatest risk at low levels. You still have a chance even if your pool is empty, though. You can overspend Resonance Points! If you're at 0 RP, you can attempt to activate or invest an item anyway. You need to attempt a flat check (a d20 roll with no modifiers) against a DC equal to 10 + the number of points you've overspent today. So the first item has a 50% chance of working, and it gets more risky from there. Using items is clear and consistent. Spend the required actions and 1 RP, and you activate or invest your item. If someone else wants to use the same item, you can remove it and let them put it on and invest it themselves. You have less to track. We get to remove some of the sub-pools that individual items have (such as "10 rounds per day which need not be consecutive" or "5 charges") because we know you have an overall limited resource. There are still some items that can't be used without limit, but they get to be special exceptions rather than being common out of necessity. It puts the focus on the strongest items. Because you can't activate items indefinitely, your best bet is to use the most RP-efficient item, not the most gp-efficient item. You want a high-level healing wand because you get more healing for your Resonance Point rather than getting a bunch of low-level wands because they're cheap. Investiture limits what you can wear. That means we don't need to rely heavily on an item slot system, creating more flexibility in what kind of worn items are useful. You'll read more about this on the blog on Friday, when we talk about removing the magic item Christmas tree! Will those benefits be compelling? Will people prefer this system over the Pathfinder First Edition system? We look forward to finding out! Want to look at an item to see how this works in practice? This cloak is deep green with a voluminous hood, and is embroidered with gold trim and symbols of significance to the elves. The cloak allows you to cast the ghost sound cantrip as an innate arcane spell. When you draw the hood up over your head (an Interact action), the cloak transforms to match the environment around you and muffles your sounds, giving you an item bonus to Stealth checks. If you activate the cloak, you pull the hood up and are affected by invisibility for 1 minute or until you pull the hood back down, whichever comes first. The cloak grants a +3 bonus. The cloak grants a +5 bonus, and invisibility is 4th level. If you're also wearing greater boots of elvenkind, the greater cloak of elvenkind allows you to Sneak in forest environments even when creatures are currently observing you. Here's a fairly complex item to show multiple parts of the system at once. The cloak of elvenkind is level 10, and there's also a greater cloak of elvenkind with an item level of 18. In case you missed it in the crafting blog, items have levels now, which indicate the point at which you can craft them (as well as being handy for the GM when making treasure hoards). Method of use indicates that this item is worn and that it's a cloak. A few items have this two-part listing because they're hard to wear multiples of. Multiple cloaks, multiple boots... not practical. Multiple rings or amulets? No problem. This item is both invested (note the invested trait) and activated (as you can see by the activation entry). Investing the cloak lets you cast ghost sound. You get this benefit as long as the cloak is invested, which means you can cast the spell whenever you want without activating the cloak and therefore without spending more Resonance Points. You can also get an item bonus to Stealth checks from the cloak (+3 or +5 for a greater cloak). Finally, you can activate the cloak as you raise the hood, spending 1 Resonance Point to turn invisible! Certainly not every item has as much going on as a cloak of elvenkind, but several classic items seemed like they needed a little extra special treatment! What do you think? Too much? This master-quality light wooden shield (Hardness 6) protects you without requiring you to spend actions each round. When you activate this shield, you can release it from your grip as a part of that action. The shield floats in the air next to you, granting you its bonus automatically, as if you Raised the Shield. Because you're not wielding the shield, you can't use reactions such as Shield Block with the shield. After 1 minute, the shield drops to the ground, ending its floating effect. While the shield is adjacent to you, you can grasp it with an Interact action, ending its floating effect. You can hold this and use it just like any other shield. Activating it lets you free up a hand to cause the shield to float, where it protects you without you spending an action! While the floating shield offers far less Hardness than many magic shields of a similar level (some have Hardness up to 18! ), it's not meant for Shield Block, and its abilities allow you to use it even with a character who needs both hands for other things. Now let's look at two special types of items: one revamped classic and one brand-new category! We went through several different iterations of staves. They needed to remain a powerful tool for spellcasters, but we also wanted them to appear earlier in the game so you didn't have to wait for most staves to appear at higher levels. Let's see the staff of healing! Made of smooth white wood, this staff is capped at each end with a golden cross adorned with a multitude of ruby cabochons. A staff of healing adds an item bonus to the Hit Points you restore any time you cast the heal spell using your own spell slots, using charges from the staff, or from channel energy. The item bonus to heal spells is +1. I've included only the level 3 minor staff of healing here. There are also versions at levels 7, 11, and 15, and they add higher-level heal spells, plus restoration, remove disease, restore senses, and more! A staff is tied to you, which means you have to invest it, unlike most held items. This investiture has two extra benefits. First off, it links the staff to you, preventing anyone else from investing the staff for 24 hours. More importantly, it restores charges to the staff equal to the highest level of spell you can cast. You don't have to expend any spells to do this; it's all part of using your Resonance Points. You'll notice this also means that if you find one of these as a 1st-level character, it will take you longer to recharge it than if you're a higher-level spellcaster. You also get the item bonus to healing as long as you hold the invested staff. Now how do you cast these spells? Well, you activate the staff as part of casting one of the spells in it (spending 1 RP as usual). Then you have two options: You can either expend charges from the staff equal to the spell's level (1 charge for heal here) or expend one of your own spells of that level or higher. Yeah, your staff essentially lets you spontaneously cast the spells in it! How about something completely different? One thing we wanted to add was a type of item that was like scrolls for martial characters. Spellcasters use scrolls and everyone uses potions, but how about something special that relies on nonmagical skills? Trinkets were the answer! Our first example was designed specifically for fighters. Activation [[F]] Focus Activation; Trigger You use Intimidating Strike, but haven't rolled for the attack yet. Dark smoke seems to writhe within this obsidian gem. When you activate the gem, if your Intimidating Strike hits, the target is frightened 2 and flat-footed against your attacks until the end of your next turn. If the attack roll is a critical success, the target is flat-footed against your attacks for 1 minute. Trinkets all have the consumable trait, meaning they're used up after being activated once. They have the "affixed" method of use, and as this one indicates, it has to be affixed to a weapon. You can activate it with a Focus Activation as a free action when you use the Intimidating Strike action from the fighter feat of the same name. This makes the Intimidating Strike more severe, increasing its effect to frightened 2 instead of frightened 1 and making it especially strong on a critical success. Now how about a trinket that's less specific? Activation [[F]] Focus Activation; Trigger You attempt a Stealth check for initiative, but haven't rolled yet. Requirements You are a master in Stealth. This copper coin dangles from a leather strip strung through a hole drilled into the coin's center. It's usually tied just below the throat on a suit of armor. Until it is activated, the coin becomes invisible for a few seconds every few minutes, but always at random intervals. When you activate the coin, you gain the benefits of a 2nd-level invisibility spell until the end of your next turn. Anyone with master proficiency in Stealth can use this trinket by affixing it to her armor. She can turn invisible by activating the coin when she rolls a Stealth check for initiative. Pretty useful in the first round of a fight! Well, there's a lot to say about magic items, and we'll have more to say on Friday. For now, I'm going to leave you with a short list of some of the new items appearing in the Pathfinder Playtest Rulebook in addition to the classics. Tell us what sorts of items you'd like to see in the final rulebook! Are item sets going to be a thing in 2e? Not sure I'm a fan of trinkets. I get that they're cheap, but that's a lot of little one-use items to clutter up a character sheet and erase and write in again and say, "Wait, did I forget to cross out that trinket after I used it, or have I not used it yet?" I'm glad that the triggers are specific with "You do X, but haven't rolled yet." That comes up A LOT for my groups with abilities that trigger on hit. Are we to assume that the invisibility of the standard Cloak of Elvenkind is 1st level while the invisibility of the greater Cloak of Elvenkind has a duration of 4 minutes? In other words, is the magical effect listed in terms of duration for the standard and in terms of level for the greater? Shouldn't they both be listed the same way? I like trinkets. More weak but eccentric and interesting items are good. I also think I like the resonance system, but confess to being a little wary about additional bookkeeping at the table (for instance, when a character has to mark off a charge from a wand and a use of resonance for the same action). This will be fun to playtest. 46 people marked this as a favorite. Deeply unhappy. The more I read of resonance the less I like it. I'm one of those who likes using many lower level utility items. When I get to 10th level if I don't light up like a christmas tree something has gone very wrong IMO. It's one of the things I love about 3.x/PF. You just don't get that from other games as much. Cloak of Elvenkind: Can you wear it (not invest), and still use the activation power? Or does the invisibility power effectively cost 2 RP (one for the invest, one for the activation), so amortized its better if you use it multiple times a day. I don't understand staffs. So, I activate the staff using 1 rp when using a healing spell to add +1 healing. But in order to cast a spell out of the staff I can spend an rp, then another rp for lvl 1 heal? Or Spend and rp and spend a lvl 1 spell? Cloak of elvenkind is cool, but I wish it had a lower level version. Trinkets seem nice, is there a chance we'll get trinkets that last multiple uses instead of 1? Is there a limit to affixed trinkets per thing? That shield seems nice, it floats around me, I'm assuming it will follow me wherever I go? Also seems like a nice way for a THF to get some bonus AC for a fight (first turn activate shield and draw weapon). It seems odd to me that casting a spell from a staff costs charges per spell level +1, but then again the flat one makes sense so that casters don't buy staves just to spontaneously cast their spells all day. When a caster uses a higher level slot to cast a spell from a staff, can they heighten the spell if it has heighten effects? Oh, also, I notice this is all listed in GP not SP like things before it were. Is this a mistake, or are these items more expensive then a quick glance tells me? I will say I think the Cloak of Elvenkind can be made... more obvious. I wish the Invested text stood out more, especially since the item also has an activation. Additionally, I think the invested bonuses and resonance-costing activations should be in two, clearly delineated paragraphs. It should be very clear what you get from investing and what you get from activating at a glance. Also, any reason that the Cloak's focus activation is [[A]] instead of [[F]]? I assume A is for action and F is for free (or reaction?)? How do these actions work with the Interact action to use the invisibility? I expected we might see more about wands here, but all in all, I'm glad to see most of what we see here. 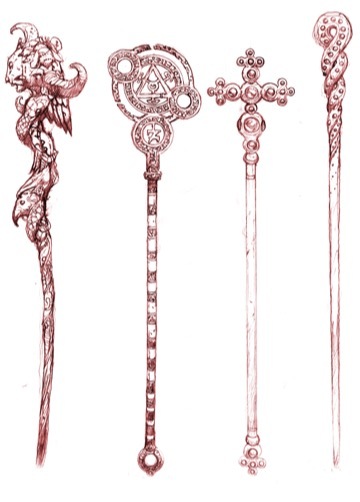 I like staves conceptually, even if the staff of healing isn't that interesting (though actually, now that I think about it, it could probably work as a good option for a party without a cleric, but I'm not sure how much it will bridge that gap), and the worn items seem interesting (though it's going to take a while to remember we're on the sp standard, and not balk at "Only 1000 gp?"). I like the spontaneous casting aspect to staves. That feels more like a magical implement than wands and staves have before. Going just from this, I think Staves might see more widespread use, finally. This is good new for me. Well at worst by level 10 you'll be able to have 9 invested items, at best 15. Either scenario seems to let you have a bunch of minor stuff. Perhaps more now you aren't as limited by slots, be bling with 10 rings and some fancy shoes. I like what they have done with the cloak of elvenkind. Although selling “nobody else can use the stave for 24 hours” as a benefit seems like a stretch, particularly when presenting the one for healing. The recharging is good. Staff cantrips seem pretty pricey, though, since they cost 1RP each. That said, I love the staff! For the equivalent of PF1’s 600gp, you’ve got something like an eternal wand for a “caster”. (It seems like it would take some fancy wordsmithing to avoid ancestry cantrips or even item-granted innate spells from allowing you to recharge staves with the full set of charges.) This addresses my concerns over wands having limited charges. I like the invisibility options presented here! Fear Gem seems way too niche. Do I have to slog through Fighter’s feat list in item form to find items that work for me? I almost feel like those ought to be presented with the feat or skill they require. Ooh boy this is a big one. I like the general idea of resonance but I am still highly suspicious. Tracking both resonance and charges on some items seems counter intuitive though I like doing away with the slot system. The item text doesn't make it clear that casting ghost sound's doesn't cost resonance, I assumed it did until i read the explanation paragraph. Also is focus a regular action or the new swift action? [[F]] or [[A]]? I like this. General spellcasting boon + spell recharging. I notice that there isn't a divine tag on the item anywhere though... curious. Sure this is what I expeted from resonance, and here it is a bit simpler though I am a little confused by the difference between an operate action and an interact action. I like this concept, especially if they are easy to craft which I expect they are. [[F]] must be a swift action otherwise thees are terrible though. Overall it's a big departure from PF1 which I am open to. I guess I see more that I like than dislike in this particular blog post so I am mildly positive and willing to learn more. I guess I will need until Friday/August to see enough rules to make a judgement. They aren't that cheap. I believe that it was stated that characters start with something like 15-25gp. The value of gp has greatly increased in this new edition. Looking over trinkets more, I'm really disliking their consumable nature, 12 vanishing coins are roughly the price of a cloak of elvenkind, and while you get 2 more rounds of invisibilty, they grant far less especially since they get consumed. I'm curious on whether you guys had office talks about turning trinkets into 1/day items for their activations rather than 1 time only? 1 time only seems a little too harsh and nonuseful. How does a vanishing coins price compare to a potion of invisibilty's? Staff cantrips seem pretty pricey, though, since they cost 1RP each. They are actually free to cast. The vanishing coin's price includes the fact that you can use it while rolling initiative as a freebie as long as you were sneaking; you'll have it up even if your enemy gets the drop on you. So is investing in the staff the only way to restore charges? can I manually restore more charges if necessary if I'm not high enough level to invest all the charges back? Do magic weapons (i.e. +1 sword or fiery ammunition) cost RP to use? You Invest the staff at the start of the day (or whenever you find it) for 1 RP. Thereafter, so long as you're holding it, you get a free +1 bonus on healing. You can get that bonus all day long, without spending any more RP after the first. Later, you can Activate the staff, spending 1 RP, to cast one of the listed spells. You either cast it straight out of the staff (just like in PF1, using up charges) or using one of your own spell slots (just like a PF1 cleric spontaneously casting a cure spell). You invest one RP for the day. Now, the stave improves all your healing. It gains charges equal to the highest level spell you can cast. To cast a spell from it (other than a cantrip; thanks Mark! ), you spend one RP and either a staff charge per spell level or an equal-or-greater spell slot. As I recall, [[A]] is action, [[R]] is reaction, and [[F]] is free action. I'm about 95% sure 4th-level invisibility is PF1's greater invisibility. I sure hope the flavor text gets separated from what the item actually does in the Rulebook, and not mixed/in front of it. "This copper coin dangles from a leather strip strung through a hole drilled into the coin's center. It's usually tied just below the throat on a suit of armor. Until it is activated, the coin becomes invisible for a few seconds every few minutes, but always at random intervals." mixed in front of all the items to know what they are about... Hell, that description is twice the length of the sentence describing the mechanics and there is no way to know where to start reading if you just want to know what the item does. Flavor is good, but don't place it mixed with the mechanics of the item. Also, I see no mention about any Trinket Limit... Can I have 50 of them afixed to my Armor? 30 gems in my Weapon? BTW, all the Opperate/Focus/Command Activation descriptors are useless if we don't know the mechanic differences. So far I assume Focus is Free, Command is 1 Action (Verbal, no AoO) and Opperate is 1 Action (Somatic, generates AoO). But would have been nice to mention it from the start. Sure - let's hope I don't get hurt and need to drink a potion or two though. 41 people marked this as a favorite. I've made my feelings on Resonance known before (I really don't like it) and this blog just cements my dislike even further. 1) This was never an issue except with "Item must be worn for 24hs" kinda stuff. Everything else (Handy Haversacks, Cloaks of Resistance, Cloaks of Elvenkind, Boots of Speed, whatever) you could just take off, hand to someone else, and they could use it fine. Same with weapons/armor. 2) This is partly true, but then this very same blog has an example of an Item with charges. So you spend resonance and the item gains charges and then when you activate the item you spend resonance again and then you either spend a spell slot or a charge to cast. Real simple there, for sure. 3) We'll see, but it's already a thing with potions, where the second best healing potion is so much cheaper that taking the resonance hit is far better than the gold hit. And I expect this will happen with other items too. 4) Getting rid of slots doesn't really fix anything. There were rules in place already to create items with similar effects in different slots, to try and have utility everywhere. That, and having consumables use resonance (especially single use consumables) is still something that rankles. So overall, pretty bad from my perspective. Do magic weapons cost RP to use? I believe only when using abilities like the flametounge's scorching ray. 17 people marked this as a favorite. Charisma still makes sense for Resonance for me. I don't think classes like the Alchemist should get to use another stat. Instead, class abilities and feats that interact with Resonance should just get bonus Resonance as part of the ability, much how getting a Spell Point ability gives you 2 more Spell Points. Item sets would be cool if that's a thing. I'm glad only "jewelry" and similar small items are exempt from item slots, and that people can't actually wear multiple cloaks or boots. I can see the price of at least wondrous items has been re-examined if a cloak that not only provides a skill bonus but can potentially cast Invisibility 20 times a day is only 1000 gp (10,000 gp PF1). Not keen on charged items still existing on top of resonance and costing both charges and resonance. It looks like anyone can use a Staff or similar item, not just a caster who has that spell on their spell list. Only a caster can recharge the staff but again, that doesn't have to be a caster of that type. I remain positive on the general idea of trinkets overall. I'd be happier with ones like the Coin if they provided a base effect if trained in the skill, and then a better effect at the higher level of proficiency. I'd be happier with ones like the fear gem if they had more general interaction with using Intimidate and weren't tied to a single specific feat. I remain deeply displeased that potions, trinkets and other consumables use up resonance. Especially with it looking like the price of consumables is still a nightmare, with a strong healing potion costing 1200 gp (12000 PF1) and a one round scroll of invisibility not only costing 85 gp (850 PF1) but also being Master tier locked. There is very little incentive to get consumables if they are disproportionately expensive for their benefit compared to a permanent item. Perhaps there could be a universal rule about this so that this wording doesn't have to be repeated for each trinket? How long does it take to affix the trinket, or is it part of its activation? It feels weird that only a stealth master can activate a magic item; it would feel more natural if the effects increased with proficiency or perhaps it temporarily granted an ability from the next proficiency level. Also I am left wishing for expensive but non-consumable trinkets at higher levels. On the other hand, for something so thematically simple and iconic as the cloak of elvenkind I wish there was a cheap low-level version without the fancy spell activations. What does it mean "you can also get a stealth bonus from the cloak" - is it a choice when investing? Or should it just say "you also get the bonus"? I do like the new staves. The wider scaling you have for staves should apply to more magic items. Even with staves it just lets me wondering why can't I make a generic staff of spellcasting (or perhaps limited to some spell school(s)), with a pool of charges and special abilities based on my level modified by appropriate feats, and imbue whatever spells I want into it at the time of crafting? Can a crafter who cannot cast stabilize or heal make the staff of healing? Not really sure I get the reason for trinkets. How are they different than potions or consumable wondrous items were in PF1? I'm definitely not a fan of attaching them to armor or weapons - that feels like a bad import of a common video game implementation. They'd fit my view of magic in Pathfinder much better if they were amulets which you activated as needed rather than attached. I'd love to hear what the real intent of trinkets are - is this filling a need which existed, or just renaming wondrous consumable items? Is there a reason they attach? I thought it was slightly off-flavor for the cloak of elvenkind to have ghost sound. I think adding invisibility to the cloak fit its role in the game of being better at hiding, but ghost sound seems tacked on. My current concern with resonance is that it seems like it will make magic item use more selfish. Why should I use my limited resonance on items which heal others rather than make me better at stuff? If the party healer is out of resonance, that staff of healing isn't too useful, even if all the injured fighters and rogues have lots of leftover resonance they'd love to use on healing. Does the staff of healing having multiple levels just mean that it gets bigger healing spells? Do all staves effectively have one spell now, which levels up with the staff? Or are there still staves which have multiple thematically linked abilities? Also, do they count as a weapon, quarterstaff presumably? Finally, the staff of healing seems pretty blingy. I'd envision a healing staff as being a lot more humble, plain wood with carvings, not rubies and gold. It is the same as "I have used that potion or not?" If the player has a tendency to forget to cross out used potions (or scrolls, or other single use items) it generates the same problem. I would assume that the Interact action is distinct from the Activation effects. So, by investing in the cloak, you gain ghost sound as an arcane cantrip. When you have invested in the cloak, you can Interact to pull up the hood and gain the Stealth bonus. When you have invested in the cloak, you can use the Focus and Operate actions to Activate it, spend a Resonance point, and become invisible. I'd probably do a set of notecards with them on there that I'd keep with my character. If I use them, rip them up. I could also hand them to others for any reason. I'm sure someone like Perram is already looking at this and planning a "Trinket Card" website to create your own set. Interesting, this makes it seem better. Also I just noticed that the coin specifies 2nd level invisibility, whereas the cloak doesn't, is there a reason why? Oh no a slightly tough choice! Joking aside I hope the time to invest is reasonably short, such that a player like you can HAVE many items and invest in the more niche ones as needed. It says it has both a Focus Activation and an Operate activation, which both cost 1 action. The cloak has 3 abilities... Ghost Sound, Stealth Bonus and Invisibility. So which one is which activation? Is Ghost Sound cast with the normal components of the spell so it doens't need to be listed, then? Also, I get that the cloak has the "Invested" tag so it means you can attune to it. Which abilities of the cloak require attunement? Just the Ghost Sound? Or is it all 3? Also it's unclear which of the abilities of the cloak require spending Resonance to activate. Is it just the Invisibility one? Where is this specified? I realize some of that info was explained in the blog after the item entry, but the itme entry alone left A LOT of questions. - While invested you may cast Ghost Sound cantrip as if it was prepared. - [A] Operate: Put or remove the hood. You gain a bonus to Stealth when its put. - [A] Activate: Spend 1 resonance point to gain the benefit of Invisibility for 4 minutes or until you remove the hood, whichever comes first. As a GM I found writing up all special item loot on index cards to hand to players (and take back when consumed) has been a good general practice. "Potions, magic armor, and magic weapons all expend resonance points, which is determined by a player's level plus their charisma modifier." The way the cloak of elvenkind works isn't clear at all to me. What does the Focus Activation do? Cast the cantrip? Activate the invisility? Is the Operate Activation used to pull the hood, or that's a different interaction? In Pathfinder 1e, high level play necessitates martial characters load themselves down with magic items containing buffs or other abilities, in order to keep up if there's no dedicated buffer in the party. However, it seems as though resonance is designed to artificially limit the number of items like this that they can have. An effect only compounded by the fact that the majority of non-magical types don't have build points to spare on having a high charisma, and are therefore limited in resonance. Would you care to explain the rationale behind such a decision? I believe the point of trinkets is to provide martials with a way to get an edge in combat without hurting action economy. As a caster, I love good options that I use instead of my main class features- those features are limited! As a martial, my abilities are all day, every day. If something takes two actions, that’s a lot less murder. It’s worth it to pay some cash for emergency one-shots that don’t cut into my murder-actions. "Normal" magic armor/weapons cost 1 RP via investiture at the beginning of the day to power their 'always on' effects. If the item also has an additional power that you can choose to use at different points, that costs additional RP when used.